Apple recently published a new section to its iOS App Store that throws a spotlight on subscription-based apps offering free trials to new users, a move that plays into the company's wider push toward subscription pricing. Seen above, the new "Try it for Free" subcategory appeared in the Apps section of the App Store this week and is currently limited to four apps 1Password, USA Today, Lake: Coloring Books and Panna: Video Recipes & Classes — all of which have offered trials for some time. Each app is displayed alongside a large icon of its respective subscription service. 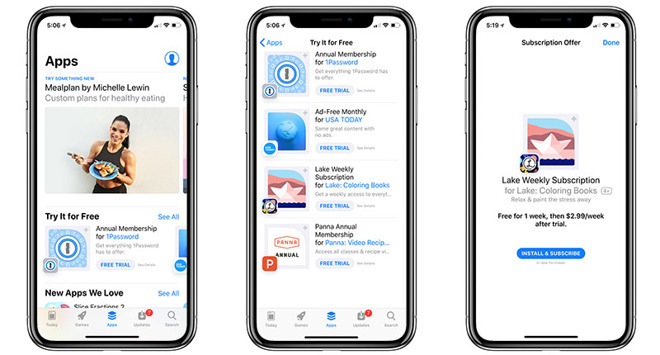 Apple lists a service's subscription option, like "annual membership" or "ad-free monthly," followed by a hyperlinked app title and button to start a free trial. Tapping on the app name navigates to that title's dedicated App Store page, where users can find more information about available subscription options. For apps that are not already installed on a device, selecting the "Free Trial" button triggers a subscription offer page that allows users to download and subscribe in one step. When an app is already installed, tapping that same button will open said title and take users directly to an in-app payments page. For example, if a device owner was at one time a 1Password user, perhaps prior to the company's shift to subscription-based plans, tapping "Free Trial" opens the app's "Choose a Plan" page and triggers an App Store payment screen. Users can verify the purchase to start a free trial. Apple has been urging developers to take advantage of expanded subscription pricing tools for well over a year, a strategy that can in some cases goose revenue while increasing platform stickiness. In 2016, the company began taking a smaller 15 percent cut of in-app subscriptions maintained for over one year. More recently, Apple in December introduced a new feature that allows developers to offer discounted introductory pricing or limited-time free trials on auto-renewable subscriptions.